Noor Majan believes that successful language acquisition occurs, when students are repeatedly challenged to develop their listening, speaking, reading, and writing abilities in a structured environment. Thus, Noor Majan’s intensive Arabic program reflects this idea by developing all four language skills with a focus in three distinct concentrations; foundational knowledge in Modern Standard Arabic (MSA), skills development, and application of knowledge through media literacy. The program will provide intensive reading, writing, speaking, and listening practice for 25 formal contact hours per week, lasting for a total of 4 weeks per term, a total of 100 formal contact hours per month. In addition to the 25 formal contact hours per week, Noor Majan’s intensive Arabic course strengthens students abilities with 2 hours of language partner sessions per week. During these language partner sessions, students will learn how to apply their classroom knowledge in a real-life setting, solidifying their knowledge. Noor Majan uses authentic and genuine material from print and broadcast and media from the internet. 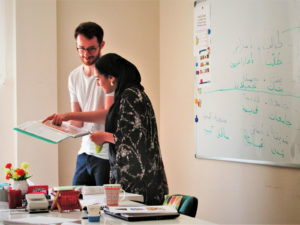 Students will acquire the competence to consume, understand and comment on news broadcasts, articles, excerpts and forum contributions using the adequate language register.Throughout the course, students will build on existing knowledge in Arabic grammar, vocabulary, pronunciation, spoken and written skill-sets. Finally, students will be introduced to various spoken dialects, enhancing their ability to understand the greater Arabic speaking world. Listening: Students will develop the ability to comprehend utterances in the target language in recorded form broadcast media, in both fusha (MSA) and commonly spoken Arabic as found in reports, interviews, and talk shows. Although the material listed above is Noor Majan’s standard offering for Arabic courses; we can accommodate for an extensive set of curricula, dependent on your needs and requirements as an institute. Our institute and teachers are able and willing to deliver to your requirements. Please inquire for information regarding your requirements and curriculum. At the end of the unit/program, beginner students will be able to form short and simple sentences. Students will possess a good amount of basic vocabulary as used in familiar and everyday situations with a limited ability to use this vocabulary correctly grammatically in all related situations. They will be able to answer formulaic questions with only rare occurrences of mistakes in vocabulary and grammar. Students will start expressing their thoughts independently of formulaic expressions albeit their uttering may be incomplete or incorrect at times. Students will be able to understand the general content of speech on familiar topics and will have developed a more accurate sense of differentiation between similar sounds of the Arabic alphabet for their own text production. At the end of the unit/program, Advanced Beginner students will be able to express themselves about personal topics and issues relating to daily life in short sentences. Students will be able to express their needs, requirements, and wishes (in a restaurant, hotel, taxi or shop) and speak about their hobbies. They will be able to answer non-formulaic questions to a certain extent and be in sometimes able to correct themselves while speaking or writing. Students will have a more fluent reading ability and develop a better sense of Arabic written expression. Students will be able to understand the general content of speech and will have developed a more accurate sense of differentiation between similar sounds of the Arabic alphabet. At the end of the unit/program, Intermediate students will be able to converse confidently about social issues. They can retell stories and speak about events that happened in the past. Students at this level will be able to express themselves about a variety of topics in all tenses. They can be understood by native speakers and partake in their conversations. Students will be able to understand and analyze Arabic grammar as used in diverse sources. Students will be able to use new grammar and vocabulary in order to produce coherent texts about social, historical, and personal topics. At the end of the unit/program, Advanced students will be able to express their opinion supported by arguments and can coherently reply to other opinions being expressed. Students at this level will be able to speak and write about varied and complex topics and issues that do not pertain to their direct environment and life. They are able to understand abstract texts and speech and can express themselves on these topics intelligibly. They are able to process authentic text sources of the target language such as print and broadcast media, books and websites. They can independently develop on the issues raised in these source texts and organize written and oral texts on a formal language level. At the end of the unit/program, Higher Advanced students will be able to express their opinion supported by arguments and can coherently reply to other opinions being expressed. Students at this level will be able to speak and write about varied and complex topics and issues that do not pertain to their direct environment and life. They are able to understand abstract texts and speech and can express themselves on these topics intelligibly. They are able to process authentic text sources of the target language such as print and broadcast media, books and websites. They can independently develop on the issues raised in these source texts and organize written and oral texts on a formal language level.